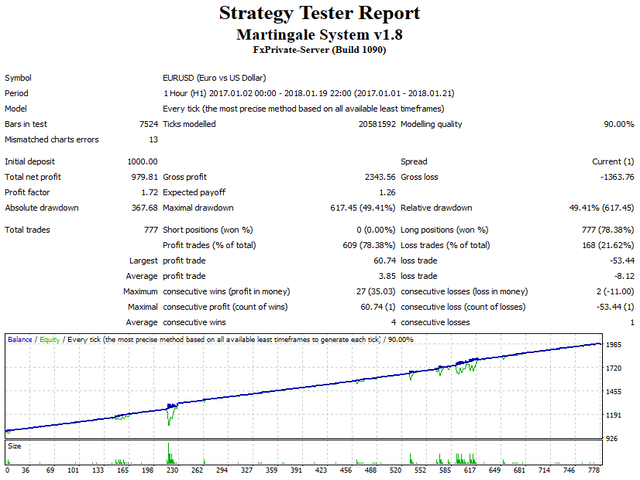 I present you an Expert Advisor based on the Martingale system. The trading volume used for opening positions depends on the parameters Lot and Multiplier. Martingale system, which proportionally increases the trade volume according to set parameters, is applied when you open a trade. Please note that the EA features the ability to select the trading direction: Buy or Sell. Timeframe: the EA is optimized for Н1, but any timeframe can be used. Other: the trading direction is selected depending on the monthly or weekly trend. Bullish trend - Buy direction and, accordingly, Bearish trend - Sell direction. Amount - the maximum number of orders (no more than 7). First transaction profit - amount of profit for the 1st deal. Step for the second deal - step for the 2nd deal. Second transaction profit - amount of profit for the 2nd deal. Step for the third deal - step for the 3rd deal. Third transaction profit - amount of profit for the 3rd deal. Step for the fourth deal - step for the 4th deal. Fourth transaction profit - amount of profit for the 4th deal. Step for the fifth deal - step for the 5th deal. Fifth transaction profit - amount of profit for the 5th deal. Step for the sixth deal - step for the 6th deal. 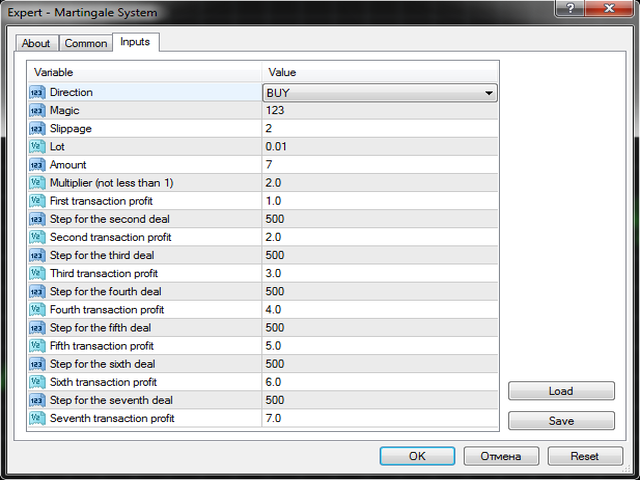 Sixth transaction profit - amount of profit for the 6th deal. Step for the seventh deal - step for the 7th deal. Seventh transaction profit - amount of profit for the 7th deal. Part of the information on the EA operation is intentionally left undisclosed! Your feedback is appreciated! I will consider your offers and add improvements in the shortest possible time!